4-star Hotel Petit Dru, Morzine – Portes du Soleil, Haute Savoie. In a setting dedicated to wellness, a short walk from the heart of the village of Morzine, Le Petit Dru reinvents the art of living well in the present and the future, by making our guests the centre of attention. The traditional architecture, ideal location, sustainable and top-quality materials, balconies to spend time on, high-end services and respectful renovation of our historic chalet tell the great story of the Baud family. It brings together our values and philosophy of authenticity, expressing our vision of the art of living and hosting. Here, “discretion is a diamond”. Here, a sense of time takes its place as a vital element of genuine luxury. The time of craftspeople, designers and decorators, who have selflessly given themselves into building then renovating a place whose fascinating past and positive future symbolise our business, ‘the art of living’. Time, which does not abide when we let it pass us by, has always been our driving force. Our four stars make up a little constellation above the resort of Morzine. 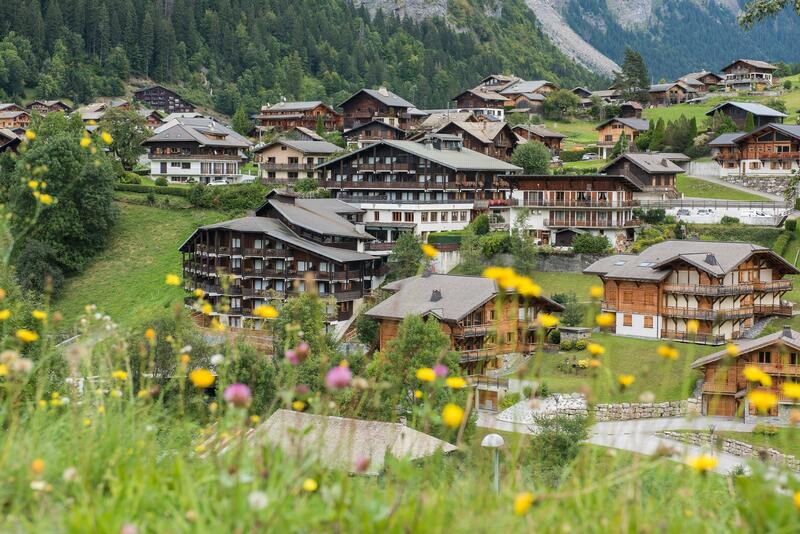 This 4-star hotel in the heart of the Portes du Soleil lives up to its name…. Luxury is not a detachment from life here. It is not ostentatious. It is experienced internally, but is not synonymous with isolation. In fact, it mixes plurality with serenity, proximity with confidentiality. At Le Petit Dru, the interior is worthy of the exterior, with luxury in harmony with the seasons, and with time. Inside, luxury lies in the detail of the contents and materials, the space in our suites and rooms, the quality and originality of our services, the design inspired by the setting, with respect for the environment. Luxury is preserved intimacy combined with services in perfect harmony with the needs and requirements of every guest. Outside, it lies in the accessibility of summer and winter sports, the diversity of the places to relax, for culture and food and drink. In short, luxury lies in the pluralistic freedom in the resort to discover its 1001 facets, all a few steps away. Much more than an exceptional location, “Le Petit Dru” Hotel is a state of mind, enabling all guests in all seasons and situations and in complete privacy, to escape and recharge in the heart of the Alps. The larch roof shingles and evocative architecture bring our majestic four-storey mountain chalet into perfect harmony with its environment. Sculptural yet unpretentious, it seems to have always been here, in the heart of the village of Morzine. Its ample size cladded in muted hues and fine materials echo the age-old buildings all around throughout the landscape. As soon as you enter, the tone is set. Reception, the lounge, the bar and the fireplace open up to the visitor with no barriers other than the subjective ones created by the materials, contents and hues. All this brings a unique personality to every space, combining aesthetic refinement with an intimate atmosphere. Then let your eyes and imagination seek out history, modernity, contemporary design and traditional craftsmanship. A tacit dialogue takes place among the monochrome autumnal tones, between the patina of a wall and the polished concrete of a counter, between the nature of solid oak and the elegance of time-cherished leather. Creativity and originality combine with spirit and lightness, offering a new art of living and hosting, in the midst of luxury and authenticity.